SAP has significantly expanded its presence at the world’s largest smart city trade fair – because it knows that to score with forward-thinking urban centers, it needs to attract their attention. 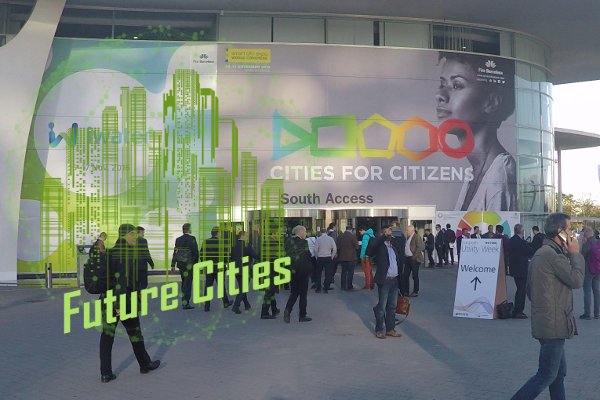 “Cities for Citizens” was the motto of this year’s Smart City Expo World Congress, held annually in Barcelona, Spain. Mind you, “Technology for Movers and Shakers” would have been just as apt because the demand for information about IT-based tools that support the implementation of smart city concepts was overwhelming. The sessions in the “Data & Technology” track were all exceptionally popular. So popular, in fact, that there wasn’t enough space in the packed auditorium for everyone who wanted to attend. Take the author of this article, for example, who attempted to follow the podium discussion entitled “Real-time Open Data Fueling the Next Generation of Urban Services” on the first day of the congress. He failed to join the line early enough and was among the unlucky ones who didn’t get a seat. It was the same story with the other technology presentations, too: Get in line early or miss out! During the “Disruptive Technologies Transforming Cities” session, one of the topics the protagonists discussed was the extent to which Design Thinking and Blockchain could fuel the development of future cities. Although opinions differed, the podium speakers agreed on one point; that belief in progress alone is not an adequate foundation for urban planners. After all, if you champion the benefits of autonomous vehicles, you have to go on to answer the question of what happens to all the bus drivers who lose their jobs as a result. Technology for the urban environment is never an end in itself, even for the very smartest of cities: It must always dovetail with the strategic objectives of visionary urban development. “A city’s digital transformation will not be driven solely by technology,” writes smart city expert Hazem Galal in global magazine Cities Today. “While advanced ICT is vital,” he maintains, “the concept of a smart city goes far beyond technological advances” and is built on a “clear common vision of the future.” “Before embarking on the smart city journey,” Gala adds, municipal authorities must develop a clear road map and involve their citizens in the process. “It’s also enormously important to ask the right questions”, said SAP manager Barbara Flügge (cross-industry and IoT taskforce lead) during the session entitled “Big Data for More Responsive and Human Cities”. These include: What issues do cities have? What are they aiming to achieve? What are the benefits for citizens? The concerns of a city that is in danger of losing its appeal as a business location because it is not doing enough to create attractive conditions for industrial development will differ enormously from those of a city whose most urgent need is to reduce the amount of waste it produces. In her presentation, Barbara described how SAP uses urban analytics to get to the heart of its municipal customers’ requirements—so that it can identify specific fields of action based on the analysis results. And there is one aspect that should not be forgotten, said Barbara: How can you predict the future needs of those people who are either unable, or do not wish, to live in a city? There is no doubt that the problems of rural depopulation are inextricably linked to the advance of urbanization, and the inhabitants of rural areas are still waiting for long-term solutions. Sadly, this correlation was not investigated in any more depth at the congress. The increased interest in technology was also evident at the accompanying congress exhibition, which is attracting more and more traditional IT companies every year. SAP’s stand on the Smart City Plaza was twice the size it was in 2015. And, after a slow first morning, SAP’s stand personnel had more than enough to occupy their time. Martin Klein, who coordinates development for SAP Public Sector, reported that although some customer meetings had been arranged in advance, a large number of interesting discussions had developed ad-hoc during the exhibition, leaving him very satisfied with the outcome of the event overall. Visitors to the SAP stand viewed joint displays with partners including Hitachi and Intel and with start-ups. And, just across the way, they marveled at the functions of a smart street light developed in Karlsruhe as part of the SAP/EnBW project “Sm!ght”. During a brief chat, Martin confirmed that SAP was now positioning itself across a broad range of industries in the future city environment in order to address the market more holistically and with greater precision. Under the umbrella of the SAP Public Services organization, colleagues from key industries such as transportation and utilities collaborate with members of Tanja Rückert’s IoT team. And there is no lack of potential for interesting projects. Because, nowadays, almost every big city styles itself as a “smart city.” During the event, major urban centers including Vienna, New York, Dubai, Pune, and Tel Aviv queued up to showcase their offering and services for citizens. But is life really more livable in those cities? Is there a way of measuring which are the smartest cities? The consensus of the speakers at the “Benchmarking City Performance: Indicators, Metrics, Standards” session was that general rankings don’t help. Which makes sense; because no two cities have the same needs and each develops so uniquely and from such a different starting situation that a comparison wouldn’t work anyway, as SAP representative Marlyn Zelkowitz (Director Future Cities and IoT) pointed out. Marlyn presented two dashboards that SAP has developed for the Texan cities of Houston and McKinney. The authorities there use area-specific, customized measures to check whether their projects are on track or not. “Interacting with other cities is a helpful way for a city to develop and refine its own smart city profile,” she added. Even the mayor of Rio de Janeiro, Eduardo Paes, is not too proud to learn from others, as he proved in a podium discussion—entitled “The Road towards Smart Cities”—featuring top business and municipal executives. “Don’t be afraid of copying ideas,” he said. Now there’s a smart tactic if ever there was one. Aiming high: Tampere, Finland, home to a population of around 380,000, is aspiring to being nothing less than the world’s smartest city. To achieve this, Tampere’s municipal authorities are focusing on close collaboration between local industry and the city’s world-renowned universities. The aim is to link up with partners to build an ecosystem that will make the city future-enabled in key areas. SAP was one of the first companies invited to support the city in this development. Our photo shows the city’s mayor, Anna-Kaisa Ikonen, attending the kick off of the “Smart Tampere” project, which was celebrated officially at the Finnish city’s exhibition stand at Smart City Expo.